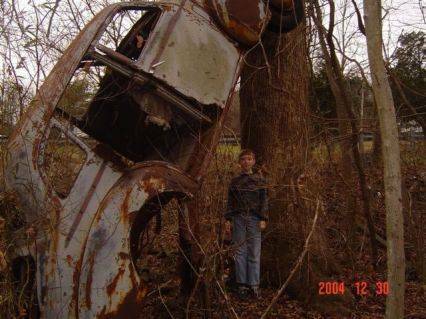 Old Studebaker up a tree Photo Picture Classic Cars for sale & Classifieds - Buy Sell Classic Car & Classic Truck Classifieds. Silly Car!!! You can't climb trees. Go car GO! Your almost there! i heard about driving a chevy to the levee but this is ridiculous, must have been chasing a squirrel! all female drivers are not bad driver.i think my wife only dented two cars slightly.i on the other hand have totaled several.by the way ,her first ride was a 1962 impala 327.her daily driver now is chevy avalenche. Damn squirrels will take anything not nailed down. so did the tree grow and lift it up over time....? hey looks like the racoons want to drive too. When I first started driving in 1974 I was out running the roads and spoted this old car up a tree. In those days it was in alot better shape. I think that back in 50s and 60s there was a junkyard down the road and this was used for advertisement.